At home we planted a tray of tomatoes-yellow tumbling toms, red Sweet Millions (cherry), Moneymakers and Super Marmelades (beefsteaks), mainly for the greenhouse. 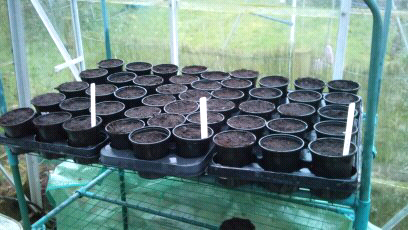 I planted a tray of chillis too, so the invasion of the windowsills has finally begun. In the greenhouse Jake and I planted 50 odd broad beans for the allotment as the bed they're going into isn't ready yet. Next job..digging. 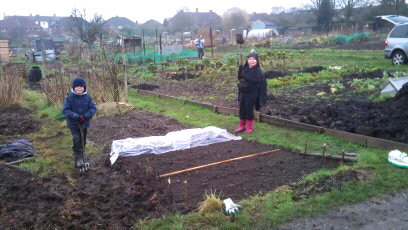 Must get the second bed ready for the broad beans within the next three weeks.